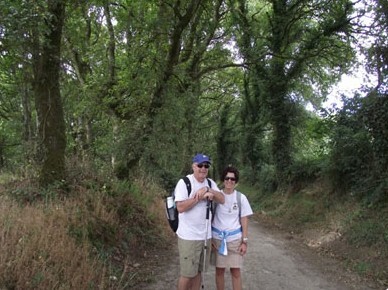 Joe and Judi from California walked the Camino de Santiago with CaminoWays.com earlier this year. 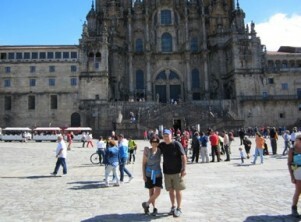 We share their Camino experience, as written by the couple en-route, for their Camino blog. If you bumped into Joe and Judi along the way, you might have noticed they wore very special t-shirts: they are t-shirts commemorating the 300th anniversary of the birth of Father Junipero Serra, founder of the California Missions. The shirts were designed by Joe and Judi’s friend, artist and graphic designer Kimberleigh Gavin. 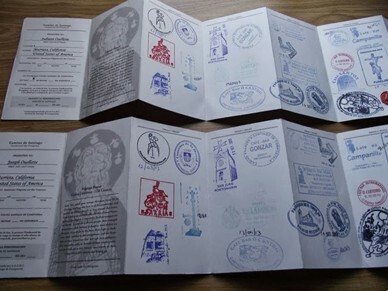 Our “Credencial del Peregrino’ passports have arrived! We are walking 5-7 miles on a fairly regular basis and will start carrying our daypacks this weekend. We are in our final preparation stretch. We are trying to practice everything before we start our adventure, including the wine! We feel that we are well prepared, however we are going to kick up our mileage a notch. We’re trying to eliminate the “morning aches”! We’ve checked the weather and it is trending nicely, however, I ‘m expecting at least one day of rain. Hopefully it will be light showers. As we start our journey, we are looking forward to your comments. We will try to reply as quickly as we can. Pilgrims or Peregrinos have been walking the Way of Saint James for thousands of years. The Way is also known as the Camino de Santiago. The traditional starting point is St Jean Pied de Port, France, which is 800 km from the cathedral in Santiago de Compostela. However, most pilgrims walk the last 100 km due to time constraints. This is the path that we have chosen. 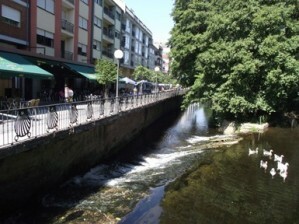 Why do we want to walk across northern Spain for 5 days? We wanted to do something different and find a way to connect with the people of northern Spain. We thought about the walk as a “spiritual experience” and above all, its good exercise. In reality, we want to have a fun journey that we can share with our friends. All pilgrims travel with Credentials, or passports that are stamped along the way, mostly at hotels or hostels. Stamps can also be obtained at churches and government buildings. One of our passports (ready to be stamped!) is pictured below. Upon completion of our walk, we will present our stamped passports at the Credential Office where we receive our Compostela, a handwritten certificate that indicates that we have completed our journey. After a great night’s sleep, we were ready to conquer the first leg of our Camino. We were surprised at the number elevation changes and the variety of the trail conditions. That being said, the walk was everything that we thought it would be. The surroundings and our fellow Peregrinos made up for the the difficult conditions that we encountered today.Tomorrow, we will walk approximately 20 miles and will start around 8:00am (sunrise) and end in Palas de Rei. On Saturday we walked to Palas do Rei, it was a very interesting and challenging 25 km. Our legs were hurting along with our feet. There were many elevation changes, some very steep, going up and coming down. Most of these sections were covered with many rocks and shale. This kept us moving slowly through these areas. However, we finished the day with a glass of wine with friends that we met along the way.This is being posted a day late because of poor internet service again. After of grueling day yesterday, today’s walk was more pleasant. We walked through many forests with large canopies. The weather was a little cooler and it appeared to threaten rain for most of the day. We enjoyed most of the walk with Liz and Elizabeth. Elizabeth is named after her mom and to avoid confusion…..well you get the idea. We couldn’t ask for better walking companions, the conversation was great and we laughed for much of the walk. We arrived in Amenal around 3:00 and immediately had a glass of wine. A reward for another day on The Camino. On to Santiago tomorrow……our final day! The final day was full of excitement and anticipation. Again, we thought that we would have to break out our ponchos, but Mother Nature would not allow that to happen. It was still a was a very challenging walk. Our trail took us from the 15th century to the 21st. A most notable sight was on Monte do Gozo, where early pilgrims first saw The Cathedral. Also, on that same hill was The Pilgrim Monument, dedicated to all peregrinos. After that, it was into the city, population 80,000. It is also city that houses a large university. During our final half hour, an elderly pilgrim lost his footing and tripped on the stone sidewalk and scraped his face and Judi’s first aid kit was put to good use. She had the bandages that allowed him to complete his Camino that day. We were glad that we were there to assist. The total distance walked was 119 km or 74 miles. It was an exciting and emotional experience. We arrived at 1:15 pm and waited in line at The Pilgrim Office for about 45 minutes to receive our Compostela (certificate for completing The Camino). 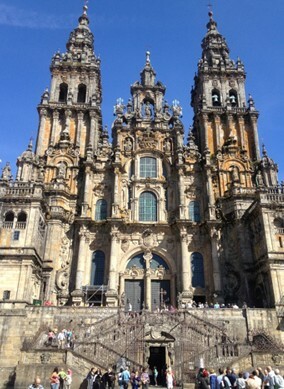 We made it to Santiago de Compostela! More to follow…. After our amazing journey, we had a day to enjoy the city and reflect on our time spent on the trail. We, also, attended the Pilgrim’s Mass and viewed the tomb of St. James, located behind the large altar of the Cathedral. During the mass, the large incense burner or botafumeiro was swung in front of the altar and through the transept of the church. It was a truly amazing sight!